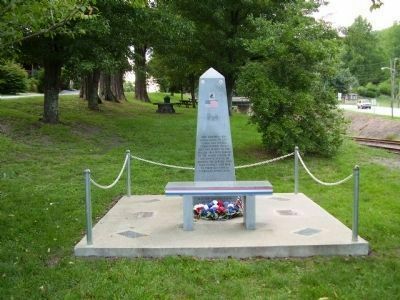 This memorial was established to give honor and special commendation to all men and women of the Saluda area who served in the Armed Forces of the United States of America. 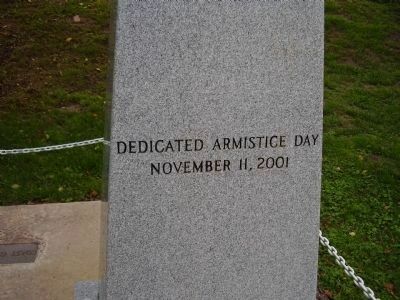 The service they gave in peace and war to their country is eternally appreciated. 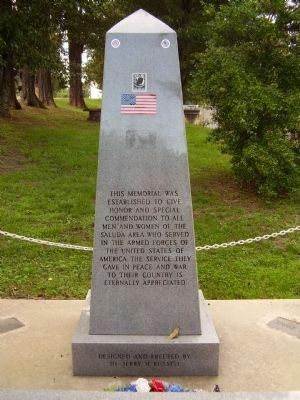 Erected 2001 by Dr. Jerry M. Russell. Location. 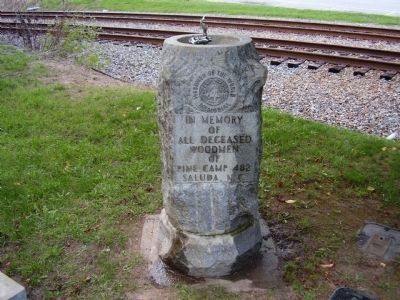 35° 14.132′ N, 82° 20.947′ W. Marker is in Saluda, North Carolina, in Polk County. Marker is at the intersection of Greenville Highway and Irving Street on Greenville Highway. Touch for map. 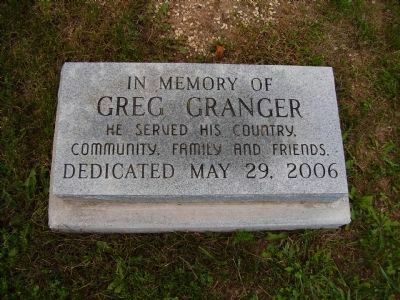 Marker is in this post office area: Saluda NC 28773, United States of America. Touch for directions. Other nearby markers. At least 8 other markers are within 6 miles of this marker, measured as the crow flies. Forever on Duty (within shouting distance of this marker); Saluda Grade (within shouting distance of this marker); In Honor of Nolan D. Pace, Sr. (about 300 feet away, measured in a direct line); E.B. 'Baty" Hall (about 300 feet away); Vance-Carson Duel (approx. 5½ miles away); Tryon Peak (approx. 5.6 miles away); Harmon Field (approx. 5.6 miles away); Flat Rock (approx. 5.9 miles away). Touch for a list and map of all markers in Saluda. 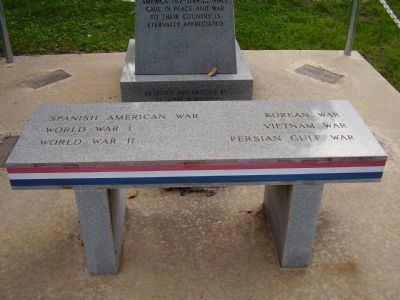 This is located on the right side of the memorial. More. 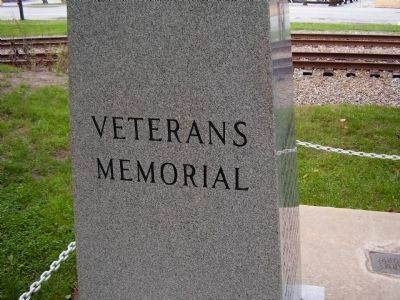 Search the internet for Veterans Memorial. Credits. This page was last revised on June 16, 2016. This page originally submitted on September 12, 2008, by Stanley and Terrie Howard of Greer, South Carolina. This page has been viewed 1,194 times since then and 8 times this year. Photos: 1, 2, 3, 4, 5, 6, 7. submitted on September 12, 2008, by Stanley and Terrie Howard of Greer, South Carolina. • Kevin W. was the editor who published this page.